Marshall Fant was born in Anderson, SC and moved to Rock Hill with his family in 1996 when his father became the pastor of Harvest Baptist Church. Marshall was called to preach following his freshman year at Clemson University and finished his college degree at Bob Jones University with a Bachelor of Arts in Bible, graduating in 2007. He completed his Master of Arts in Bible at Bob Jones Seminary in 2009 and his Master of Divinity at Calvary Baptist Theological Seminary of Lansdale, Pennsylvania in 2014. Marshall joined the staff of Harvest in 2009 as an Associate Pastor and became the Senior Pastor in 2017. Marshall married Jenna in December of 2007. Both Marshall and Jenna worked several summers at The Wilds and were lead counselors there. Marshall and Jenna have three children. 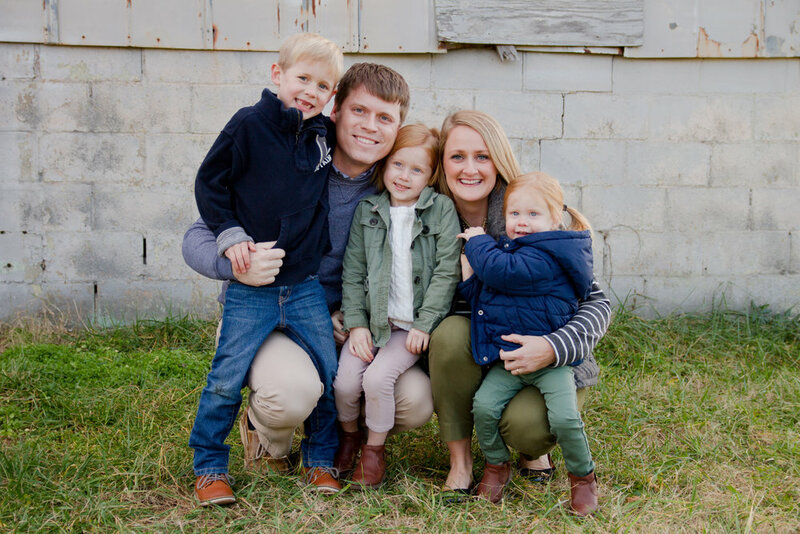 Drew Bedics graduated from Bob Jones University in 2010 with a Masters in Pastoral Studies, and his wife Danielle graduated from Pensacola Christian College in 2008 with a Bachelors in Missions. Drew is currently pursuing a Masters of Divinity from Central Baptist Theological Seminary. They were married and moved to the Charlotte area in 2010 where they served at Centerpointe Baptist Church for several years assisting with many aspects of ministry. Drew and Danielle have three children. Drew joined Harvest in 2015 as the Associate Pastor of Youth. Randy Hibbs was born in Brownsville, PA, but moved to Michigan with his family at the age of 12. Randy trusted Christ as his Savior in 1970 and was called to pastoral ministry during the Summer of 1973 as a counselor at Camp CoBeAc – a Christian Camp in northern Michigan. Randy and Donna both completed bachelor’s degrees at Maranatha Baptist Bible College; Randy with a Bachelor of Arts in Pastoral Studies and a minor in Public Speaking, graduating in 1976 and Donna with a Bachelor of Science in Education in 1977. After many years in pastoral ministry that took them to Illinois, New York, California, Indiana and Wisconsin, Randy completed his Master of Arts in Biblical Counseling at Maranatha Baptist Seminary. Randy met Donna at Maranatha and they were married in April of 1977. Randy and Donna worked together in various church and Christian school ministries until 2002 when they joined the staff at Maranatha Baptist University. Randy served as Director of Financial Aid and Donna as Admissions Office Manager. They have five children and nine grandchildren. Randy joined Harvest in 2019 as the Associate Pastor of Discipleship. Eirik Shevy grew up in Michigan where his dad was the senior pastor of a church in the small town of Hanover. Life was always about ministry in the church and to the church. He attended Maranatha Baptist University earning a Bachelor of Science in Music Education and many extra classes in Bible and pastoral studies. He also attended Bob Jones University meeting his wife, Brigette; they both received Master of Music degrees in church music in 2005 – Brigette in composition and Eirik in vocal/choral music. After their schooling, they taught music and Bible in Taiwan for two years followed by six years teaching music at Inter-City Baptist School in Allen Park, MI. Feeling God calling them to aid a church in developing their music program, they moved in 2013 to help here at Harvest Baptist Church. They have four children and love being in Rock Hill, SC.